Ever year, for a few days of September, Krynica Zdroj becomes the economic centre of the world. During the Economic Forum thousands of visitors talk about the most crucial problems of the global economy. The meeting attracts personalities from the world of business, science and politics. Coverage from meetings held in Krynica is reported by journalists from all over the world. This year, the presence of Think About the Future Foundation during the 24th Economic Forum was simply a must. Founded by the President of FAKRO - Ryszard Florek, Foundation hosted one of the panels. We strive to arouse interest of Poles in the economy. Our activities are directed to all social groups, among others, politicians, officials, journalists and entrepreneurs. Such a group of people meet in Krynica. Can you imagine a better place to achieve objectives of the Foundation? In addition, we also learn during this type of events. Most of the people present at the panel are authorities in the field of economy. It is worth to listen and exchange experiences. – explains Director of Think About the Future Foundation - Bożena Damasiewicz. The driving force of any economy are family-owned companies. The influence of domestic entrepreneurs on the economic development of the country was discussed by the owners of Polish global companies: Krzysztof Domarecki (Selena), Ryszard Florek (FAKRO), Michał Sołowow (Barlinek, Synthos) and Kazimierz Pazgan (Konspol). Representatives of the world of politics were also important participants of the meeting. The debate was attended by Janusz Steinhoff (Chairman of the Council of Polish Chamber of Commerce) and Olgierd Dziekoński (Secretary of State in the Chancellery of the President of the Republic of Poland) and representatives of the world of science: Anatolij Zadoja (First Prorector, The Dnipropetrovsk University of Economy ). Domestic companies contribute to the development of a particular community to a much greater extent than foreign companies. When entering the market, foreign companies invest in order to sell their products, manufacture them cheaper or to make money on a particular market, but with their economic community in mind. Better place of work and higher salaries are associated with domestic global companies present in a particular country which added value produced in that country is sold abroad. What is the most important is that the greatest possible amount of money should enter Poland. We need to export as much as possible, not only products but also services, technical thought, computer programs and tourist services. By that means other communities are working on our prosperity, and not only the other way around . – emphasizes Ryszard Florek. President of FAKRO is very actively involved in all activities aimed at building strong economic community. During this year's Forum, he participated in six panels discussing issues important for the future of our country. 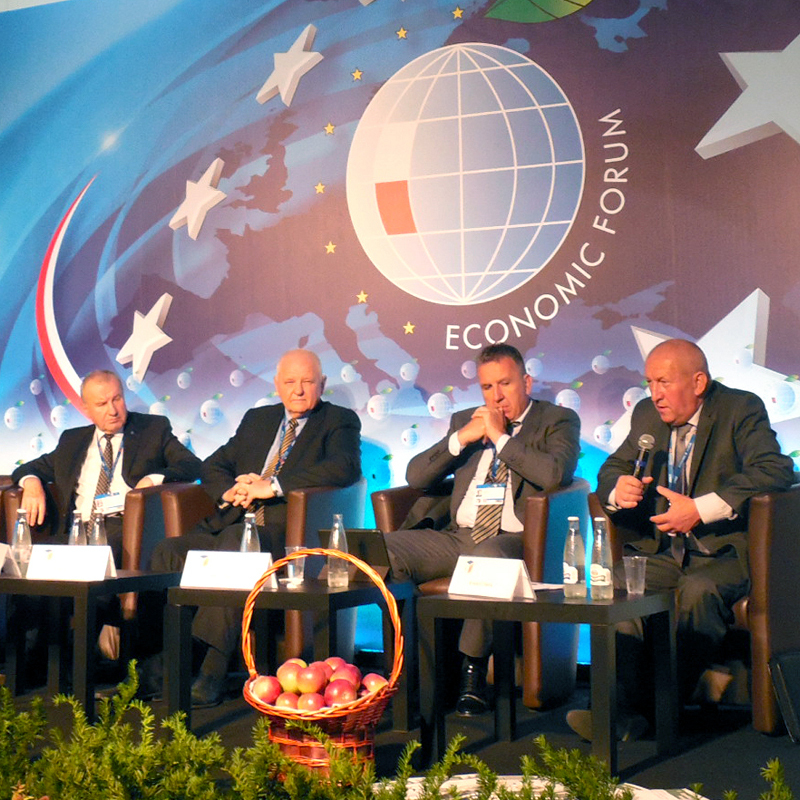 Like every year, FAKRO was a Partner of the Economic Forum in Krynica.